Boulder City High School sports teams took home a number of awards for succesful baseball, softball, and swimming seasons. 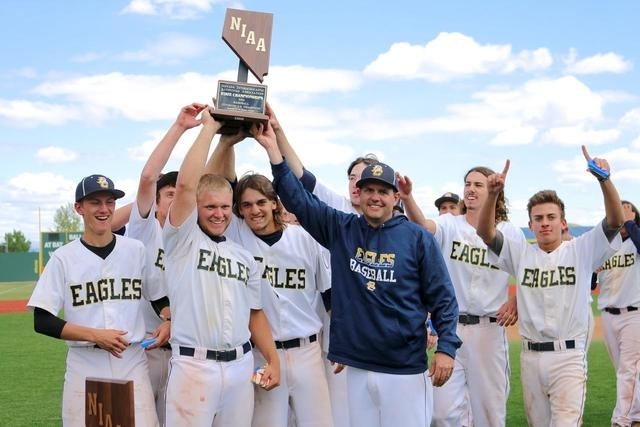 The reigning Nevada high school baseball state champion Eagles were heavily represented during the coaches All-Region and All-League award nominations, with several key contributors slotted amongst their star-studded roster. Taking home player of the year honors not only for the Sunrise league, but for the entire Southern region of the Division I-A, senior Peyton Koopman was awarded as the state’s best following a senior campaign in which he was both clutch at the plate and lights out on the mound. Throwing a perfect game for the Eagles and smashing home the state championship game-winning home-run, Koopman finished his senior campaign with a 8-2 record on the mound, with a 3.02 earned run average and 56 strikeouts, while batting .504 with 41 runs batted in, 11 doubles and three triples and home-runs apiece. Also earning first-team All-Southern Region honors for the Eagles was seniors Steve Wagner and Nolan Desantis, along with junior Alec Mathis. A two-way star for the Eagles, Wagner led the team with an 8-1 record on the mound with a 1.62 ERA and 41 strikeouts, while batting .241 with 12 RBIs and three doubles. Desantis, would be a key contributor at the plate for the Eagles, batting .350 with 22 RBIs, nine doubles, five home-runs and three triples, while Mathis batted .333 with 13 RBIs and five doubles. Wrapping up an incredible prep career that will be nearly impossible to duplicate, senior two-way star Charlie Masterson took home player of the year honors for the conference, following a senior campaign in which she batted .610, with 55 runs batted in, 12 doubles, five home-runs and three triples, while compiling a 20-7 record on the mound, with a 1.22 earned run average and a 193 strikeouts. Also earning first team honors for the Lady Eagles was senior Kylee Hamel who finished the year with a .387 batting average with 28 RBIs and five doubles and freshman Marlena Mills who finished with a .318 batting average with 35 RBIs and five doubles. For the six-time defending state champion boys swim team, senior Navy commit Nick Lara led an impressive group of first-team All_Southern Region nominations, following a state meet performance in which he placed first in the 100-yard butterfly with a time of 51.99. Joining the senior, was the freshman duo of Paco Cuevas and A.J. Pouch, who each shined individually at state, winning the 200-yard individual medley and 100-yard breaststroke separately, while junior Braden Klouse,sophomore Clayton Pendleton and senior Joren Selinger all appeared on the first-team as well. For the four-time defending state champion girls, were heavily represented with juniors Montana Lloyd, Sarah Estes, Mandy Gebhart and Abby Sauerbrei all making the first-team All-Southern Region along with freshman Aimee Garcia, Rose Pouch and Annika Freiburger and sophomore Nantke Bonsack. Leading the way for the Lady Eagles at state, Lloyd completed the sweep in the 200-yard individual medley and in the 100-yard backstroke with times of 2:05.30 and 56.31 seconds respectively, which set new Division I-A state records. Also placing first for Boulder City at state, were juniors Mandy Gebhart and Abby Sauerbrei, to give the Lady Eagles four individual champions overall. In the 100-yard butterfly, Sauerbrei placed first with a time of 59.50 seconds, while Gebhart placed first in the 500-freestyle with a time of 5:01.62 to set a new Division I-A state record as well. Freshman Rose Pouch also dominated her opposing competition as well at state, placing first in both the 200-yard freestyle (1:53.75) and 100-yard freestyle (53.39) to sweep both of her events as well.